Prints by Melville Island artists are being shown in one of Sydney’s most reputable Indigenous art galleries this month. The exhibition of artists from Jilamara Arts and Craft on the Tiwi Islands is proving a success at Birrung Gallery in Potts Point operated by World Vision Australia. Leading artists collaborated with printmakers at Charles Darwin University’s Northern Editions studio to create the exhibition, which was originally held at the Casuarina campus gallery last year. Also on show at Birrung are prints from the renowned Balgo community in the Kimberley, and Maningrida and Yuendumu in the Territory. Northern Editions’ manager Emma Fowler-Thomason opened the exhibition, which was attended by World Vision’s board of management, including its CEO Tim Costello and President of World Vision International, Dean Hirsch. Proceeds for the sale of works will go towards World Vision’s projects in Australia. 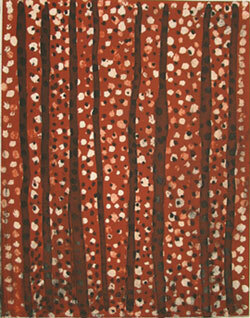 Northern Editions is now gearing up for a busy round of exhibitions this year, with a new exhibition of works from Kakadu opening in Darwin on April 19.